Office Timesheets is a web-based commercial employee time tracking and timesheet management software application designed for the specialized needs of project-driven organizations to track time and expenses for accurate cost accounting or job/project costing purposes, labor capitalization, time billing, employee utilization and real-time project time and expense reporting. Not only is Office Timesheets a timesheet application that simplifies the collection of time and expense training data, it also integrates with Microsoft Project (to ease the importing and exporting of project timesheet data) and QuickBooks to create a best-in-class small business accounting and time tracking solution. Office Timesheets also provides detailed audit trails and time reporting records to ensure compliance with any regulatory requirements, such as DCAA, Sarbanes-Oxley and FMLA. 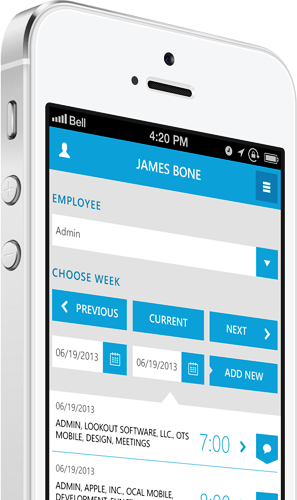 The customization and training we have received from Office Timesheets has been nothing short of awesome! Thanks for translating our requirements into a functioning solution that’s both easy and reliable. We cut our timesheet processing time down from days (sometimes weeks) to just over an hour. Office Timesheets and the QuickBooks Link have become invaluable tools for our business. Office Timesheets saves us thousands of dollars and countless hours in reporting and analysis. Even better is the knowledge and insight that it gives us in knowing how our resources are allocated across projects and tasks. We have been very happy with your service and the value that Office Timesheets has added to our business! We have enjoyed our partnership with you for many years. At the core of Office Timesheets lay two primary functions: tasks and entries. Office Timesheets tasks (a.k.a. jobs) consist of up to 10 customizable Element Levels specific to your organization, and entries to define the data specific to these items including budget rates, budget hours, user defined status flags and more. Office Timesheets includes comprehensive reporting capabilities by utilizing three powerful reporting engines: Transaction Detail Reports, Summary Reports and Detail Reports. Stop wasting hours producing your professional service bills in Microsoft Word because your accounting application can’t produce the invoices needed to meet the contractual arrangements of you clients. Office Timesheets now offers a fully-integrated time billing and flat fee invoicing module with a powerful design templating system that allows unlimited invoice layouts and data presentation elements that no one else can. Those invoices that used to take you hours can now be created in minutes! We offer time-tested and industry proven 2-way integrations with Sage 100, 300, HRMS and Abra. Our integrations modules are highly configurable right out of the box to give you organizations the fastest and best time tracking solutions for Sage 100, 300, HRMS and Abra that the industry has to offer. Office Timesheets offers two-way integration with QuickBooks that synchronizes, among other things, employees, items lists, and time entries between the two applications. Office Timesheets' Microsoft Project integration allows customers to use best-in-class applications for managing projects: Office Timesheets for time and expense tracking and analysis; and Microsoft Project for project planning and scheduling.